L’Ecole 41 held their annual release party Monday March 17th at the Space Needle, St. Paddy's Day. But also a great day to celebrate one of the newest releases from this Walla Walla Valley pioneer. Nine new releases were available to test drive along with the inaugural release of the Ferguson Estate red wine which was the highlight of the event. The sun even made an appearance to add to the festivities. The Ferguson Vineyard is the newest estate vineyard in the L’Ecole 41 family. It is named to honor Jean and Baker Ferguson, the founders of the L’Ecole 41 winery. 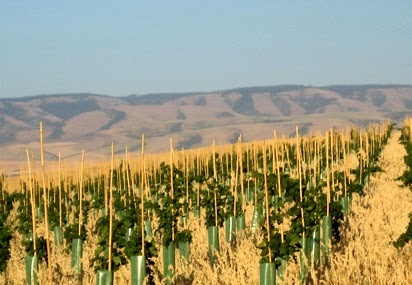 The vineyard is located near the Seven Hills estate vineyard in the Walla Walla Valley AVA. This vineyard is situated at an elevation of 1,300 feet with soils sitting on top of ancient lava flows and fractured basalt and is certified sustainable and salmon safe. The vineyard is planted with Cabernet Sauvignon, Merlot, Cabernet Franc, Malbec and Syrah on roughly 18 acres. Marty Clubb, the L’Ecole 41 Managing Winemaker and co-owner, shared some of his thoughts on the new Ferguson estate blend and the 2011 vintage. Marty explained the original 2004 Ferguson Reserve was a Bordeaux style blend to honor his wife’s parents Jean and Baker Ferguson. The original wine was a blend of Cabernet Sauvignon, Merlot, Cabernet Franc and Petit Verdot sourced from the Klipsun, Bacchus, Dionysus Weinbau and Stone Tree Vineyards. The 2011 Ferguson is 100% estate grown fruit from the Ferguson vineyard. The blend is Cabernet Sauvignon dominant with a healthy dose of Merlot and some Cabernet Franc blended in for structure and balance. The 2011 Ferguson shows notes of dark cherry, cocoa, sawdust and earthy spices on the nose. The palate features dried cherries and abundant tannins. The tannin characteristic was consistent with most of the 2011 reds just released by L’Ecole 41. Marty noted this in his description of the vintage. The structure, the tannins are certainly a good indicator that these wines have a long life ahead of them. From the L'Ecole 41 website about the Ferguson Vineyard: This 42 acre prime piece of ground was strategically selected with an appreciation for the property’s natural strengths. At an elevation of 1,300 to 1,450 feet, the cold air drainage around the site is excellent. Above the ice-age flood silts, the soil is a thin mantle of wind-blown loess overlying fractured basalt. At the highest elevation, the soil depth is only 2 to 3 feet, such that the vine roots penetrate deep into the basalt, providing a complex array of rich minerals. This rock formation is partially exposed, revealing a quarry of fractured basalt which we refer to as The Wall. Mixed layers of multiple lava flows are woven together in a puzzle-like pattern, intersected with deep veins of calcium carbonate leaching deep into the basalt." 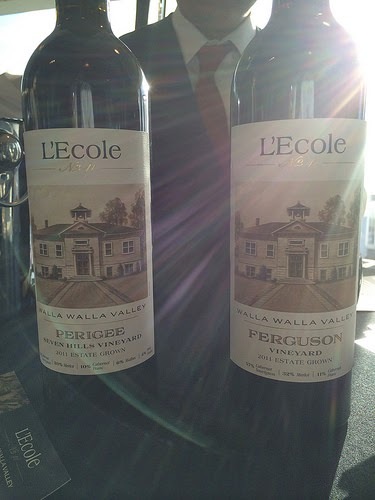 Be sure to stop by the L’Ecole 41 table at Taste WA for a sample of the estate Ferguson. You are sure to be greeted by friendly people and enjoy some fine Washington state wines from one of the pioneering Walla Walla Valley wine families.